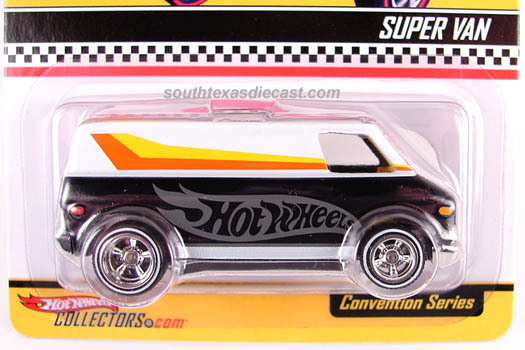 In the early 2000s the Hot Wheels Super Van made a triumphant return as it had several premium releases from 2003 to 2008 at HotWheelsCollectors.com (#HWC) and as #Convention Exclusives. This retool was dubbed as the ’70s Van due to the Super Van name belonging to another company at the time but Hot Wheels eventually regained the rights to the name and the casting has been released as the Super Van since its 2008 Virtual Convention release. Of the several premium releases during that time period, none are more sought after than this release from the 2004 Hot Wheels Custom Car Show in Tokyo, Japan. Limited to 2,000, this Super Van is a tribute to an extremely rare version of the original casting. 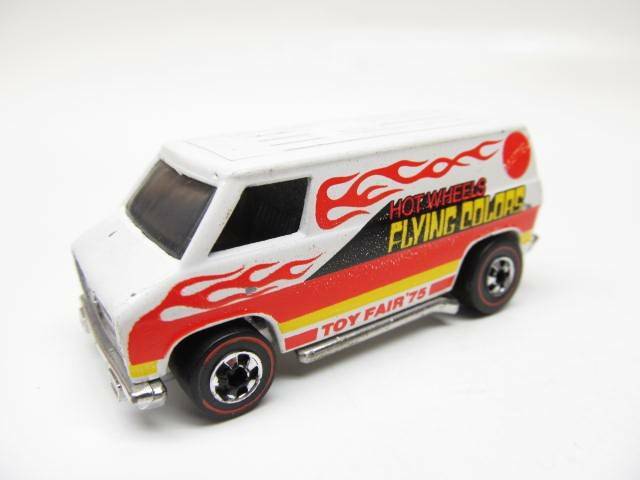 Considered as a “holy grail” by most collectors, the 1975 New York Toy Fair Super Van has a value that is in the thousands of dollars … even the beaters fetch high dollar and custom knock-offs grab a pretty penny. So when it was announced that this release of the Super Van would wear a similar graphic scheme as that original Toy Fair version, many collectors were enamored with the chance to obtain this neo-classic. In addition to the super awesome tribute graphics that feature “Hot Wheels” in Japanese and “TOKYO, JAPAN ’04” along the sides, this Super Van has a standard white/green Japanese license plate on its backside. From 2004 to 2009, the Hot Wheels Custom Car Show in Japan produced some truly unique and collectible vehicles so its sad that these are no longer being offered. The Hot Wheels customizers in Japan are also in a class of their own so its unfortunate — to my knowledge — that this event is no longer executed by Mattel. Maybe one day the show will return since customizing is still such a big part of the Hot Wheels collecting community and #JDM vehicles are all the rage. At least in the several years that the show was put on, we have some brilliant releases to show for like one of my personal favorite Hot Wheels of all time, the ’04 Super Van. RELEASE DETAILS: White Enamel Body (metal). Lightly Tinted Windshield. Black Interior. Neo-Classic Redline Wheels. Chrome-Polished Metal Base. Made in China. Toy# H4362. Released October 23, 2004 at the Hot Wheels Custom Car Show in Tokyo, Japan (limited to 2,000 pieces). For more images of your favorite Hot Wheels, check out @orangetrackdiecast on Instagram! Thank you for taking the time to write this. Great to hear!